When you write fiction, you need to know at least three times as much about the scenes, characters, maybe even about the plot, than you're going to actually put onto the page. When you build a collection of poetry: What's the magic ratio? Twice as many poems as you'll end up using? Three times? What I'm sure of is, Laura Kasischke must have an enormous stack of well-worked poems on hand -- because there are at least three threads linking the pieces in her new collection, LILIES WITHOUT (Ausable Press, 2007). One is dresses and fashionable clothing; one is the titles of prize positions for women in a beauty pageant; and the third is prayer, as in, what happens to the used ones, and is anybody listening? I could add "family" (she lives with her son, in Michigan), and I could add "growing up in pain" -- but there's no need. The three sets of guiding images wrap around all other strands here, binding the entire book into a powerful rope of conversation and image. in my subconscious, I ignored them. "Plot" may be an unexpected component of poetry, but it's abundantly present in the twists and surprises of these pieces. Death and danger take turns hiding behind and in front. Another new dress gets rejected, "Don't bury me in this / dress," my mother said." 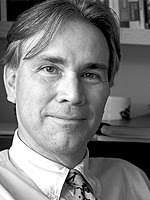 Kasischke's also the author of four novels, including a "young adult" suspense page-turner. 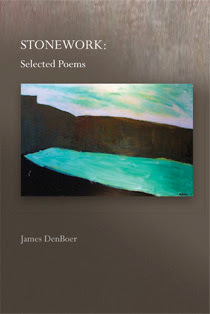 The voice echoes in these poems, making them page-turners also. "Miss Congeniality" reflects a compromise of at least winning some title, even if not the desired one -- and then the thread continues in "Miss January," "Miss Brevity,' even "Miss Estrogen." So by the time the book flowers in "Miss Consolation for Emotional Damages," the frame supports the revelations of childhood humiliation at the hands of neighbors and broken parents. Sorrow is a blossom in the garden; there's no denying its spreading roots. "Hello. Yeah. It's me. Is he in? We've got a major mess on our hands." I love the twists of humor as much as the twists of plot; this is a book to read and re-read, discovering more winks and wonderings among the lines. Kasischke's forms, open and direct, seem to offer space for reader response, perhaps even participation in the conversations of the volume. I plan to keep my copy on the nearest shelf, ready for more. PS: In case, like me, you just have to know how to "read" the book's title, consider the epigraph from Andrew Marvell's poem "The Nymph Complaining for the Death of her Fawn": "Had it lived long, it would have been / Lilies without, roses within." Factory Hollow Press publishes chapbooks and broadsides in limited editions. Factory Hollow is the publishing division of Sleepy Lemur Quality Enterprises which is the production division of The Meeteetzee Institute. The press is located in North Amherst, Massachusetts. Works published are gathered by invitation; unsolicited work won't be returned or acknowledged, not that we mean to be unfriendly, it's just that we are a very small, private operation. We hope our work encourages others to themselves publish work in small editions. 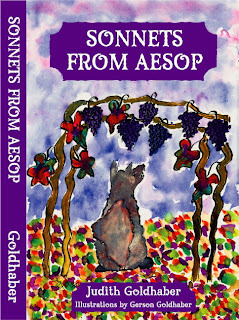 Goodan's first collection, In the Ghost-House Acquainted, braided the Montana landscape of his childhood and years as a forest fire-fighter with wintery tragedies and successes of lambing and, as a third strand, his adopted landscape of Amherst, Mass. He spoke also from family ties within the Flathead Indian community and named much of the grief in the losses that Western tribes suffer. This first book (Alice James, 2004) won the L. L. Winship/PEN New England Award. The author would like to thank Factory Hollow Press and the following people: Theodore Roethke, John Clare, Teresa of Avila, Joan of Arc, Gerard Manley Hopkins, Thomas Merton, Henry David Thoreau, the authors of the Nag Hammadi Library, and Kimberly Burwick. The poems that follow are interrupted with short feathers of text from each of these except Burwick (a poet in Goodan's closest circle). The first is, "And our thoughts became lambs," from Merton. Goodan's opening poem is "We Pass and They Pass / And Slow the World Abides." It places him lost in a ruined harvest field, mouldering from rain. And to the questions that follow these images -- questions like "Do you want to outride / The riders of your life?" -- Goodan poses the next piece as reply: "Thus I Am Called, / Thresher to the Fields." Is it Goodan or God replying? Hear the resonance of the King James Bible: "For I am the link / And the radius of the link / That bears the reduction of complication." "For I am a beam-axle glowing / With spiral roll and rigid pinion / To counter the slant of sidehills / Should I be forced to shift / Into the Lord's high gear." Then through pages that draw on lambing in snowy season, and a barn fire, and the absence of God on a dark rainy morning, we reach with Goodan "A Sigh for Avila" -- "Grackle will grackle, no matter, the sun / And weeds, our lovely strangers / Will come to us with love." He queries Teresa of Avila herself, the "little sister" to St. Francis, noting the possibility of being one with something even as abandonment settles into the bones. That the bright mares of language stride forth in their flames? Fighting fires in the West surely fueled this writing, and I pondered for some time the contrast between facing a fire alone -- whether on the hearth or in a house conflagration -- and being part of a team of friends, allied against the towers of flame. Which are we as we seek meaning in our lives? As this year of war and rumors of war wraps up, do we take "the scent of flesh carbonized by flame" -- as in Goodan's final poem, "Something Is Always Saying Hello" -- to be the wind of Baghdad pursuing us across the ocean? Or the soul-sign of Joan of Arc? This precisely framed collection fosters intensity in both its questions and its very personal answers. Its use of language and the bird presences in particular ignite joy. It's well worth adding to the shelf, placed perhaps between Hopkins and Auden, or between Dylan Thomas and Donald Revell. The words of others are of great help as we struggle to make sense of our lives. Still, it is our own words that define us at last. In placing his on the pages for us all, Goodan has lifted his lines toward prayer or praise. May the new year ahead be as rich for us all. Donald Revell's 2007 collection A THIEF OF STRINGS (Alice James Books; tenth collection from this Utah professor) lays out a landscape of the absurd -- one where Jack and Annie in a children's book rescue a bear and give it to Wm Shakespeare, while outside the pages a Hasidic child is stolen and killed by a bear -- one where military action in Baghdad is somehow Andy Warhol's war -- and step by page, transforms the twists of life and poetry into an argument for Paradise and the practice of the presence of God. The rabbit is not cold because the orchard is on fire. I landed in a tree. I could see the president dying. Love is a thing for my sole pleasure and for yours. I am violets. You are broth. The poem leads inexorably to its final line, as though it had presented a tightly reasoned syllogism. Yet God, if the God-ness must include all we know and love and fear, may indeed be such an addition of lines. At least for Revell, this comes with an expressed certainty. Covering spirits of the air beneath. Take your finger and rub it across a stone. Heat where nothing but cold most certainly is. The water does not suspect. And the lake rises. The outlet rivers rise. There is also an uprising in Kiev. When the train came. I was safe on board. But this is a train journey from the safety of childhood to the challenge of being an adult in an often unjust world. Revell draws in Dylan Thomas with the Welsh poet's near-death comment, "I want to go to the Garden of Eden to die." Thoreau's Johnny Ruyaden (young Irish Johnny Riordan) comes into this. The poet offers flowers and passengers as tokens of progress toward the Garden, framed also in a small cemetery viewed from the train. And after punching sequences of language that summon up the "piebald beauty" of Hopkins, he pushes to the heart at last in calling forth a car trip he recalls taking with his father. Picture Revell as a five-year-old, secure with mother and father and his fondly embraced Catskill Mountains. Now see the screen of the mind's film turn a glowing white-silver, erasing all color, so that the leaves of the trees and even the road itself are mirrors -- and most strange of all, embrace an understanding among Revell and his parents that the swiftly motoring car has driven into Paradise itself for a this part of the journey. It's a memory of Paradise (which Revell rhymes with "Is") that he's explored before, most lucidly in an essay called "Wine Instead of Whiskey for Awhile." And whether it's "true" or a child's misunderstanding or an adult's fabulation, the power of it hovers in the poetry and the choices of how to paint the importance of life, and afterlife. There is all the difference in the world between travel in the relative anonymity of white skin and male and middle-class privilege, and movement within diaspora. Linton Kwesi Johnson brought his dub poetry to England; now Uche Nduka, born in Nigeria, propels his innovative work from the Bremen, Germany. Written in English, without Johnson's deliberate orthography of difference, Nduka's poems in eel on reef invite at first a straightforward reading for the shape and taste of language in familiar form. But Nduka pushes against his African background and gains a fierce energy from this resistance. He salts some of the work with Nigerian references ("do i mistake the scene / for the mudland irokos of agbor?") while pounding blunt rhythms and fragrantly familiar riffs (the same page of poetry ends with "the bite of bile widens the / jazz of his voracious nights"). 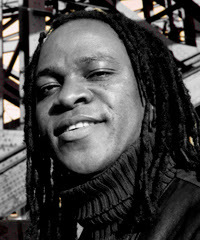 Nduka is in fact a percussionist as well as poet and essayist. And the parallel with jazz throughout this volume helps to draw the less straightforward passages into a kind of improvisational music. where rains go to die. There are no titles, no headings, few guidelines other than line breaks and page breaks, and I found the collection felt best to me when reading it as a sequence, a long dance in and out of the shadows. For instance, the next page includes "furtive massacres / amputated legs /swollen necks" and I connect the two pages via the kick of those legs. Often sexual, always sensual, the lines climb in and out of daily life and its precedents in myth and history: "chibuzo oguekwe, / prepare the cassava / stir the bitterleaf sauce. // nobody crosses the knees / of streams anymore / or waits for us after / school, the way they did / when we were mornings." Ah "when we were mornings." That's one of the gems here, and there are many. Chris Abani is the series editor for Black Goat, an independent imprint of Akashic Books -- "The series aims to create a proportional representation of female, African, and other non-American poets." That's a long way from the 1988 formation of the Dark Room Collective, and even a giant step beyond the opportunities flowering from the grounds of Cave Canem. I wish this collection hadn't been freighted with the long and overdone explanation by Kwame Dawes at the start -- so I recommend skipping past those pages and plunging directly into the waves of the poems instead. "but sometimes I'm outfoxed by my own cunning." the pleasures they themselves cannot enjoy. 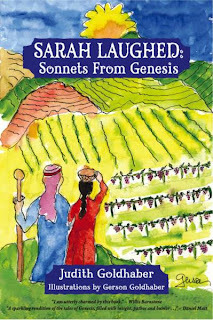 A quick two years later, Goldhaber brought out her next collection, in 2007: SARAH LAUGHED: SONNETS FROM GENESIS. And here the delight is the braid of quirky mirth, daring imagination, and matter-of-fact exploration from this scientifically trained grandmother (she's a former science writer for the Lawrence Berkeley National Laboratory in California; her artist husband is a physicist at Berkeley). For instance, the sonnet sequence opens with the little-mentioned existence, especially in Jewish lore, of Adam's "first wife" Lilith. In Goldhaber's hands, Eve's obsession with her predecessor becomes the drive for consulting the serpent, who admits, "victims always get my sympathy." Alas, a sympathetic serpent isn't a very helpful friend to this curious foremother of the tribes to come. Then there are playful renderings of Sarah's laughter at her late-life pregnancy, with God's own sense of a joke; and of the rivalry between Joseph and his brothers, with its bitter fruits. Goldhaber doesn't flinch from the tortures and deaths of Genesis, but she spins them onto the page with the calm acceptance of someone who already knows that life comes in light and shadow, never one without the other. guileless and raw and ignorant as a goose. I never imagined such a thing as death. past deep and mountain quail. brown, dusty, back of Wellman Burn. the earth—taste it, taste it! under my shirt, cool as a lizard. We'll be there once or twice -- it's worth the drive. Claire Van Vliet's close friend and collaborator Susan Johanknecht has released a startling new 2007 book through Van Vliet's Janus Press. Titled WASTE INCANT, it's a page-by-page confrontation of the issue of nuclear waste -- specifically, nuclear waste that's being stored in plastic (yes, really) in our oceans and our landscapes. To this end, the book arrives in a clear acrylic slipcase, 11.75 by 7.75 inches, about an inch in depth). A "petticoat" of flexible vinyl wraps the book within the case, and the covers and alternating pages are made of the same rippled vinyl, its swirls wavering like water as you page through the work. Interleaved among the vinyl sheets are pages printed on Barcham Green Cambersand and Cairo; type was computer prepared by Ellen Dorn Levitt and printed by Andrew Miller-Brown, who also did the binding with metallic shiny strips that speak of aluminum and other technological "solutions" to waste storage. On each printed page are wavering images drawn by Johanknecht from a children's textbook, Science from the Beginning (eds. B. L. Hampson and K. C. Evans, Oliver & Boyd, Edinburgh, 1962). 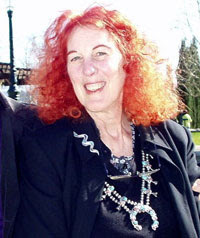 Johanknecht's other resource for the format and materials is her earlier work Hermetic Waste, which she issued through Gefn Press in 1976. The collograph prints in Hermetic Waste were derived from alchemical engravings--here the calligraphic line drawings are derived from science illustrations... Redrawn and merging, the pictorial 'facts' depict a disrupted 'nature.' Poetic texts sit inside the imagery, functioning as an integrated caption. They describe processes by which toxic material enters into the environment. The back of each pages lists hazardous wastes. She challenges the reader/holder of the book to search online using the keywords: nuclear waste storage in plastic. The edition is limited to only 150 copies, numbered, with the twelve leaves printed in black and silver. We are honored to have one copy available for sale at $290 plus shipping. Okay, so you missed Tony Hoagland at the Vermont Studio Center in Johnson this evening (Vermont poets Baron Wormser and Susan Thomas were in the crowd, though). This strong and steady writing and arts center posts its readings online at http://vermontstudiocenter.org -- but the schedules change often enough that if you're traveling any distance, it's a good idea to phone the center on the day of the reading and be sure the author has arrived and is still scheduled for that date: 802-635-2727. Coming soon: January 10, Martín Espada; January 28, Eric Pankey; March 24, Alice Notley; May 15, Fanny Howe. unpacking the imperialist baggage of heterosexuality. Between poems, Hoagland played with the old-fashioned atmosphere of the hall in Johnson, Vermont, where he admitted he felt he should be gathering the town into some political movement, like banning all heterosexual latte shops in town. But despite the teasing and satire, the poetry was tight and pointed. Within each line, the next word would arrive as if inevitable - yet be surprising at the same time. And each full-length poem mirrored this care and precision. Pine Manor College, just outside Boston, has a January MFA program that sponsors a series of readings, Friday January 4 through Saturday January 12. For full details, see the web site, www.pmc.edu/mfa -- and here are some highlights. Jan. 4 Jacqueline Woodson, author of Miracle's Boys, winner of the 2003 Horn Book Award. Jan. 5 Ray Gonzalez and Helen Elaine Lee. 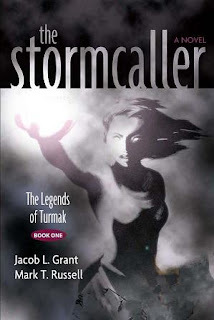 With the recent release of their book THE STORMCALLER, Vermonters Jacob L. Grant and Mark T. Russell have launched a medieval fantasy series "The Legends of Turmak." I won't do a review here -- the book's outside our areas of mystery and poetry -- but it's great to have another offering from the region. For an in-depth look at what the author team is up to (they are writing "redemption" from their viewpoint as ardent Christians), see www.isleofturmak.com. Locally, the book can be purchased at Boxcar & Caboose in St. Johnsbury, which also has a few copies of Grant's earlier, hard to find title, THE MAKER'S CHILD. For years, Kym Canter photographed her stuffed bunny rabbit with top entertainment personalities and in supermodel situations -- and last week her whimsical book STAR VON BUNNY: A MODEL TALE was launched on Amazon and in the Style pages of the New York Times (where else?!). It's hard to say what genre STAR belongs in; she's a bit poetry, certainly stylish, and definitely a gentle tease on the entire fashion industry. Star Von Bunny and Kym have already appeared at Barneys New York; Kym sent an invitation today to their West Coast party, which I'm passing along here!